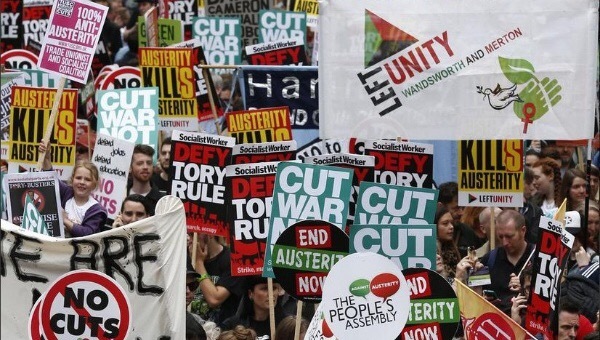 Last weekend (20th June) there was an anti-austerity march in Central London. It was reported variously that 250,000 people turned up for the march. Those who protested ranged from left-wing politicians to members of the Socialist Workers Party to celebrities. Despite this range, they were all agreed, that the current Tory government was “a bad thing”. I am not going to debate here the merits of austerity. What interested me was a debate that raged on Twitter that day, about the way our democracy works. Some of the placards and some of the tweets and speeches mentioned that only 24% of the country, or 37% of those who voted, voted for continued austerity, on the basis that this was the proportion of people who voted Conservative. It followed that the Conservatives couldn’t claim they had a mandate to carry out the cuts they had planned, in particular the £12 billion of welfare cuts that the Conservatives had promised in their manifesto without specifying how they would do it. The comebacks to this varied from the “we’ll that’s how our democracy works” to the perhaps more salient point that UKIP got 13% of the vote, and were pro-austerity, Labour got 31% of the vote, and put reducing the deficit on page one of their manifesto, and the Lib Dems got 8% of the vote by arguing that they were to the right of Labour on the deficit, so actually it was possible to argue that in fact 89% of the electorate DID actually vote for austerity. Some commentators thus pointed out that the anti-austerity marchers were essentially anti-democracy, as they were marching against what the electorate had voted for. 33% of the population didn’t vote, and if it mattered so much to them, they should have done, and then perhaps Labour would have won. But I actually feel the protest march was exactly what democracy is for. We have a liberal democracy that is supposed to be pluralist, in that it consists of competing groups arguing, being able to be heard and put their case with the government acting as a neutral arbiter between them. But in truth, austerity could hit the poorest and most vulnerable the hardest. A government policy that hits big business and the rich gets opposed at dinners at No 10 attended by those who donate to political parties. A government policy that hits the poorest and most vulnerable gets opposed by…well..250,000 people going on a march and protest in London. That’s how our democracy works. It is also why I have no truck with those that sneer at the likes of Russell Brand and Charlotte Church supporting the march. What’s wrong with them using their celebrity to oppose injustice? What would people rather them do? Advertise whiskey and watched instead? The truth is that there is no right answer to this democratic conundrum. The Conservatives won the election fair and square (or at least as fair as first past the post allows). However, whilst they can argue all they like that this gives them an official electoral mandate to carry out their policies they cannot claim with the vote share they have that it is the settled will of the people. Furthermore, there is nothing to stop people protesting against policies even if the ballot box hasn’t worked. In fact, we should be proud of a country in which is happens. So, both sides actually used some weak arguments last weekend when they had far stronger ones available. Whether that was because of ignorance or pure dogmatism remains to be seen.